So, fairytales are in now. Once the domain of the Disney set, Snow White, the Big Bad Wolf, wicked Queens – they are popping up everywhere. Can’t say I’m too surprised. I’ve been reading fairytales and fairytale retellings since birth, or at least I don’t remember a time I didn’t. I’m pretty familiar with the book end, reading Gail Carson Levine, Diane Zahler, Mercedes Lackey, and I’ve got Jim C. Hines’ Princess series on my to-read list. I also am quite familiar with the Disney versions,the kids love them. The latest one, Tangled (a Rapunzel retelling) was very well done. I probably would have watched it even if I didn’t have kids who insisted on seeing it. I even vaguely remember a sitcom from the 80s/early 90s?, The Charmings I think it was called, with Snow & the Prince in the real world. It was OK but didn’t last long. The live-action Enchanted, with the animated princess finding herself in the real world was fun too. I’ve kept my eye on the newest crop of fairytale TV shows and movies. Once Upon a Time looks campy and soapy, and I’m sure I’ll catch it when the first season is released on Netflix. Grimm seemed to have much potential as a crime series where the baddies are fairytale monsters, but I’ve gathered a meh reaction to it. 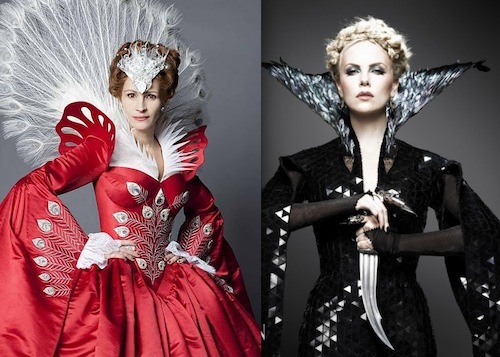 But the two biggies have to be the competing Snow White & the Huntsman and Mirror, Mirror. 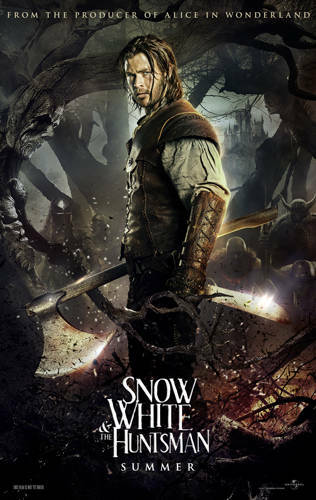 Snow White & the Huntsman got off to a quick start with their sneak attack trailer that actually looked really badass. Kristen Stewart as Snow, Charlize Theron as the Queen, Chris Hemsworth as the Huntsman who trains Snow to be a kickass warrior chick. This one has epic fantasy written all over it. I did catch the Countess of Bathory moment with the Queen as she steals the vitality from a young woman and then emerges from a bath covered in white goo (because red would be too on the nose, I guess). Poor Kristen Stewart, vampire references will follow her until she’s 90. Of course, this meant that the other Snow White movie needed to step it up and release their trailer. And with Mirror, Mirror we got something completely different. Campy, Bollywood-style dance numbers, fantabulous costumes (seriously, check out Julia Roberts’ fascinators – wonderfully over the top). Where Huntsman is dark and edgy, this one goes for the silly, which I guess is good overall, since it is so different from Huntsman. I will probably see both, but right now Huntsman is leading for me, and not just because Hemsworth is in it, although it is a good reason there. I just personally dig kickass movies, so it appeals more. However, neither one is the one I really want to see. That one would be the third Snow White movie I’ve seen kicked around on IMDB. It’s never gotten out of the pre-production stage, and has gone through different incarnations and possible casting notices. At one time I knew it as Snow White and the Seven Samurai, another time The Order of the Seven, this one is from the perspective of the Dwarves. I still hope it gets made, and that it is not rushed through production to get in on the fairytale craze, but I ain’t holding my breath. So what do you think of the recent fairytale offerings? I am with you on those two movies! I am definitely looking forward to Snow White and the Huntsman. I just hope K.Stew doesn't let me down. I haven't been too impressed with any of her acting, but the rest of the actors will make up for it, I am sure. I like the whole dark and action based more than the other. Plus, and I don't know why, I've never been a fan of Julia Roberts. Where I love Charlize Theron!! Confession time: I love a good cheesy movie which might explain why I've adored every Bollywood-stylized English language movie I've seen. Mirror, Mirror looks like so much fun! Thanks for including it. I hadn't seen the trailer before. First, a little fan-girl moment. Just wanted to let you know that I check your blog regularly, follow you on Goodreads, and that I've loved Stellar Four ever since I followed your link here (btw, that was a while ago). So... Thank you! I've also loved fairy tales for "ever after". I don't have children, but I dragged my husband to the theatre for Tangled anyway. (Wanted to see it in 3D :P ). So, Lackey, Levine, McKinley, Hale, (I could go on) I've read and loved them all. But I can't believe you haven't read Hines yet! Go! Now! They are the original self-rescuing princesses and I love them. The Stepsister Scheme is a movie I would line up to see. I'm looking forward to some live action fairy tale adaptations that don't have to be rented from behind the curtain (and I swear I only found that out when this post sent me on an internet search of other fairy tale themed movies O_O ). I can't do Mirror, Mirror. It just looks... zany. I do not do zany. I have, at best, a minuscule amount of 'zan' in me and it gets all used up by random gifs on the internet or something. Now, I can do Snow White and the Huntsman. Especially with Chris Hemsworth in it. Hubba hubba. @Bonnie - the Mirror, Mirror trailer is also way Roberts heavy, so I can see if you are not a fan that would be a turnoff. @Megan - admit it, it's the fascinators that are really drawing you in! @Ginevra - aw, thanks! And I'm glad you made it over here too (Stellar Four is a daily read for me). You're right, you're right, I must read Hines' Princess books in the very near future. @Laurie - I think this will be a good year for Hemsworth fans. Avengers, Huntsman, I know there some others too (I heard he's in the Red Dawn remake). Nice article, but I must confess, I avoid fairy tale retellings like the plague. I did read Jim Hines first princess book and it was okay, but it's not something I'd have searched out. I enjoyed his original and funny Goblin series a lot more. Retellings just aren't my thing. I'm constantly trying to remember the original and think of where it fit and whether I believe the retelling and...I guess I don't like them.